Birmingham will play host to performers from across the globe for a 24-day festival showcasing the best of international dance. Birmingham International Dance Festival also features local choreographers and participatory works from intimate virtual reality shows to huge open air extravaganzas. The festival takes in a huge range of venues including the Hippodrome, Rep and New Alexandra Theatres, mac Birmingham, Digbeth, Birmingham City University, Victoria Square and other sites yet to be revealed. And in doing so, it features community events which offer families the chance to join the dance while also showcasing new talent and bringing some highly reputed companies and choreographers to the city including Rui Horta, Wayne McGregor and Ofir Yudilevitch. While there is a huge variety in the events being staged from circus through to martial arts and fairy tales into classical ballet and cutting-edge contemporary work, organisers have ensured a theme running through the programming. And many of the activities are free. BIDF artistic director Lucie Mirkova explains: "We like to tell a story with the festival and this year it is about bodies in dance and we are challenging the perception of what a dancer might look like. It's also looking at digital and how we can extend digital and dance to create something new. We are also aiming to encourage new audiences to dance, to build strong partnerships and work with organisations you wouldn't expect a dance organisation to work with." And associate artistic director Paul Russ explains how the story progresses through the festival. "When we were looking at the programme we had a sense of wanting to tell a story," he says. "So the festival begins with everyone having a great time, seeing work from the UK, celebrating local talent, showing people what is currently happening and what is brilliant. Then over the course of the festiva,l you'll see an increasing engagement with innovative ideas and challenging new work from international voices which suggest what dance might be in the future. So it's not just about dancing for fun, it's also about dance as an art form which can say things which words can't say and music and other art forms can't do." In pushing these boundaries, BIDF also ensures Birmingham is placed not just on the dance map but also on the festivals map. 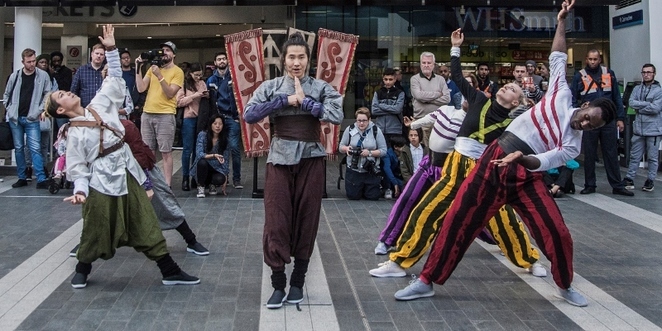 Presented by the city's DanceXchange, the festival is backed by a host of partners including Arts Council England, Birmingham City Council, West Midlands Railway, Dance Hub Birmingham and Colmore Business District. Paul says: "Birmingham is a festival city and this festival is seen as a highlight in that calendar. The scale of a festival like this allows us to attract a range of visitors from across the country and beyond to Birmingham. People will travel because of the sheer quality of the programme but equally we are doing a lot of targeted activities this year to attract artists, delegates and bookers from across the world to see the work which is being created in the city. We're working in partnership with other organisations and together we are bringing new people to the city and adding to brand Birmingham." Since its beginning in 2008, the biennial festival has emphasised the importance of free outdoors performances for all ages and this year sees an outdoor family programme on the weekend of June 16-17 with Rosie Kay, 2Faced and Candoco Dance Companies at mac Birmingham and free family events in Victoria Square on June 1-10 including acrobatics, hip-hop, circus and performers in inflatable latex suits. Paul explains: "The outdoors programme is really exciting, we're taking over public spaces in a very visible way. We're not just doing one big outdoors show, we have learned over the years that we have greater impact if we are in more public spaces and if we are in unusual spaces." And Lucie adds: "It's really interesting for us to bring the artists out of the venues and bring them to the public. It is our ambition to showcase outdoors work and to commission new outdoors work where the artist can meet the public. It's bringing people together through the act of dance so they can do something together in an activity which everyone can do. It's programmed so people can watch dance and also participate. We have chosen work very carefully so it is high quality and also accessible." With more than 30 different performances, both Lucie and Paul admit it is difficult to pick highlights but say there are some productions they are proud to be bringing to the festival. Lucie says: "There is a lot of exciting British work that we are presenting. Wayne McGregor (New Alexandra Theatre, June 1-2) is a pioneer dancer and so are Candoco Dance Company (mac Birmingham, June 13-14). And neither company have performed on their own in Birmingham for a long time so this is a really special chance to see them. Then VR_1 (Patrick Centre, June 1-4) is a new experience in dance, using technology to create a virtual reality where everyone can be a dancer and participate in that experience. And ISH Dance Collective from the Netherlands (Birmingham Hippodrome, June 14) bring freestyle extreme sports which are choreographed into an explosive show with ramps, skateboards and BMX bikes." And Paul adds: "We are really excited about the beginning of the festival, Morning Gloryville with Leftfoot (Victoria Square, June 1) where we are using dance to bring together a different kind of community event. It's part morning rave and part vigorous healthy workout that's a brilliant way to begin. It begins at 7am so it's an opportunity to wake up early and begin the day as we mean to go on with the festival. It's all about why we enjoy dancing." But whatever people choose to see, the festival organisers are promising they won't be disappointed. "People who come to the festival will have a great time," says Lucie. "Because the festival is quite broad it will give people a chance to experience what great culture they have right on their doorstep. There will be dance in inside spaces, dance in outside spaces, lots of different opportunities to dance, to watch great dance and to enjoy the city. They can have a really good time while they are seeing and experiencing something new."